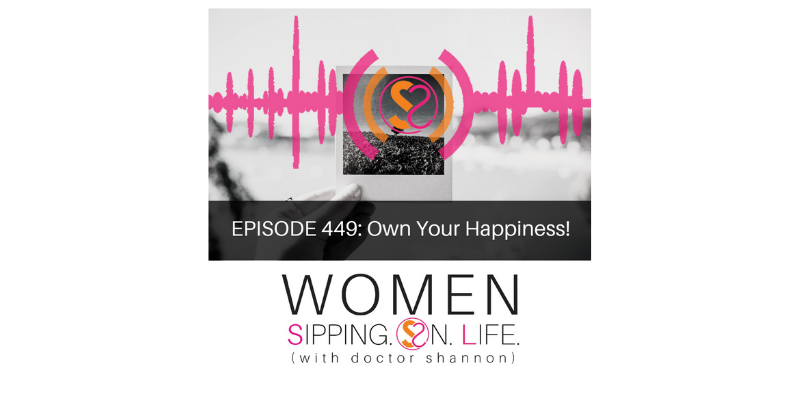 EPISODE 449: Own Your Happiness! When you take responsibility for your own happiness, and don’t expect anyone else to do it for you, you can own your happiness. We chase the illusion, or promise, of happiness, while running from the very thing that creates it. YOU, my dear, create it. Period. Once you create it, then you must choose to OWN IT by BEING IT. Stop borrowing it, renting it, paying for it, chasing it or running from it. OR…trying to be it for someone else. 1. Occupy it. And allow it to fully occupy you. You create what you desire, by taking responsibility and caring for it. AND BEING IT FOR YOURSELF. 3. Never expect someone else to make you happy. However, if you choose to be in a situation, or with someone who is constantly making you unhappy then repeat Step #1 and #2…O.W. Yes, it may feel uncomfortable, but it’ll be worth it once you discover the truth and create the “happy” that you desire. What makes you feel happy? Create it. How do you show happiness? Choose it. When you take responsibility for your own happiness, you can own your own happiness.